After much ado about Selena Gomez performing in Kuala Lumpur, Selena has finally arrived today for her concert tomorrow at the Melawati Stadium in Shah Alam. Kuala Lumpur is the second stop of the Asian leg of her Revival tour which kicked off in Jakarta on Saturday. The Selangor Islamic Religious Department (Jais) said it did not issue any notice or order for mosques in the state to hold special prayers for the Selena Gomez "Revival Tour" concert to be called off. "We did not release any order for there to be a solat hajat (special prayers) after Friday prayers to ask for Allah to cancel the Selena Gomez concert" - Jais director Datuk Haris Kasim. Selangor Mentri Besar Datuk Seri Azmin Ali had already said that the state government had no problem issuing a permit for the concert if the terms and conditions are met. Perhaps unsurprisingly, Malaysia has a fairly long history of banning musicians from playing within its borders. As far back as the early ’90s, the band Chicago wasn’t allowed to perform because some of its members had long hair. Beyoncé canceled her 2007 concert after refusing to change her revealing costumes for the country, while Kesha and Erykah Badu have also seen their shows canceled. Other artists who’ve had run-ins with Malaysian authorities over their image and lyrics include Gwen Stefani, Rihanna, Mariah Carey, Avril Lavigne, and the Black Eyed Peas. Both Elton John’s and Adam Lambert’s performances have been protested because the artists are gay, and Lady Gaga, Katy Perry, Madonna, and Shakira are all banned from appearing there, ever. 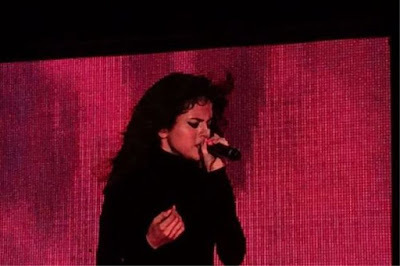 But thankfully for Malaysia’s Selenators, Gomez’s show will go on. On Tuesday, Datuk Seri Azmin Ali, Selangor’s menteri besar (chief minister), announced that there was no reason to cancel her concert because every month — not just Shawwal — should be treated with equal respect, and also, “sexiness is God’s creation”. - Yahoo! Next stops after Kuala Lumpur will be Thailand, Singapore, Philippines, and Japan. And then there's another side of Selena Gomez.. Indeed! But sad in a way that ticket price doesn't get one the full extent of the concert, e.g. one doesn't get to see the full range of stage costumes, among others. Sorry, no discount.